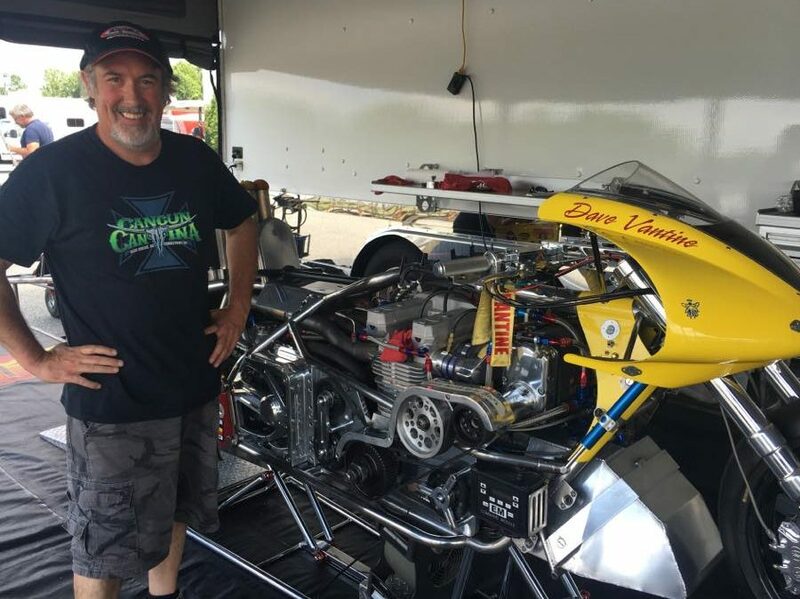 Competitive and talented motorcycle drag racing veteran Dave Vantine has a lofty goal for 2018. 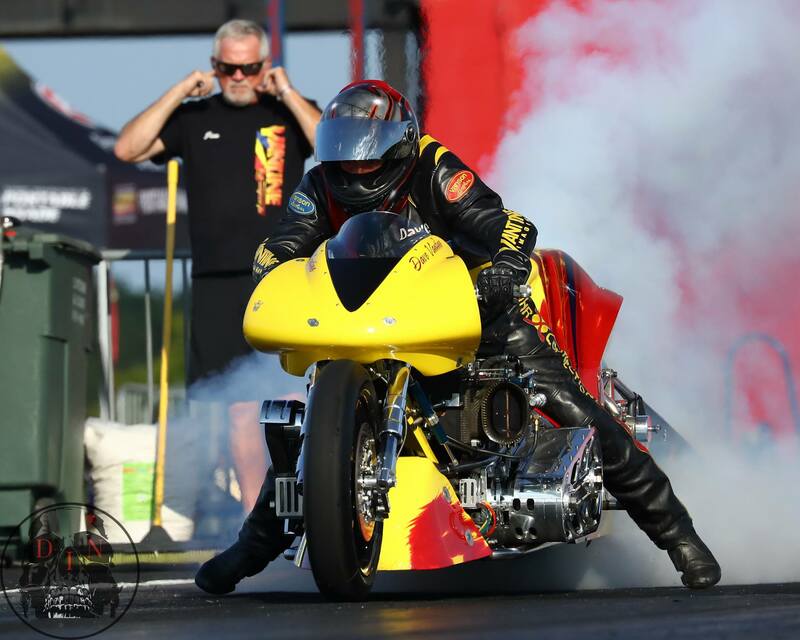 The Hamilton, N.Y. based Top Fuel Motorcycle pilot is aspiring to be the second competitor to reach the much admired and celebrated 5.60 zone. “I’m very excited for the season,” Vantine said. 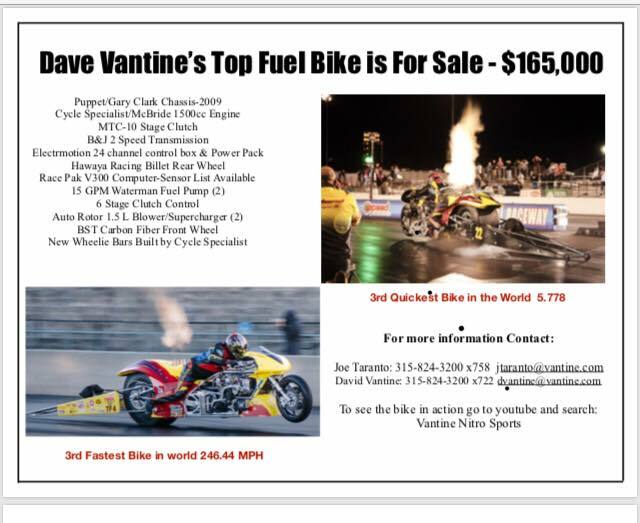 Off-season improvements to the ultra-fast “Yellow Bullet” Top Fuel Motorcycle have Vantine feeling very optimistic. The bike has been upgraded to a 2.1-liter supercharger, up from a 1.5 liter, and a fuel pump capable of 17 gallons per minute, as opposed to the 15 gallon per minute unit the team utilized last season. Vantine’s 5.77 early-shutoff run from Nov. 2015 has him ranked as the third quickest motorcycle racer in the world, behind only McBride and Sweeden’s Peter Svensson. Dave Vantine blasting off the line. 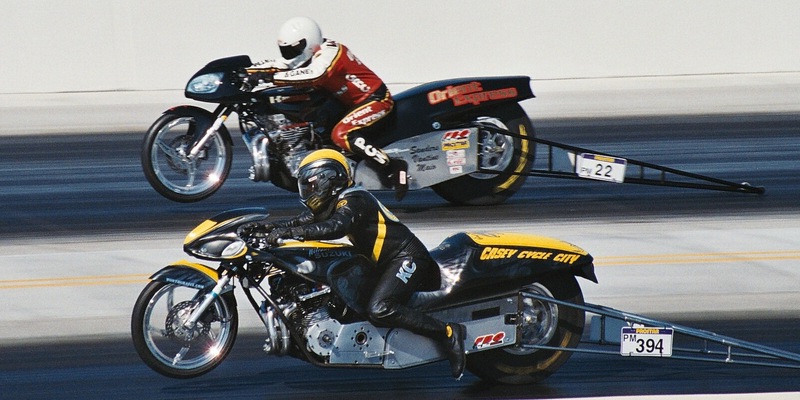 Vantine’s journey to becoming one of the world’s quickest motorcycle racers began more than 30 years on a Yamaha FJ 1200. 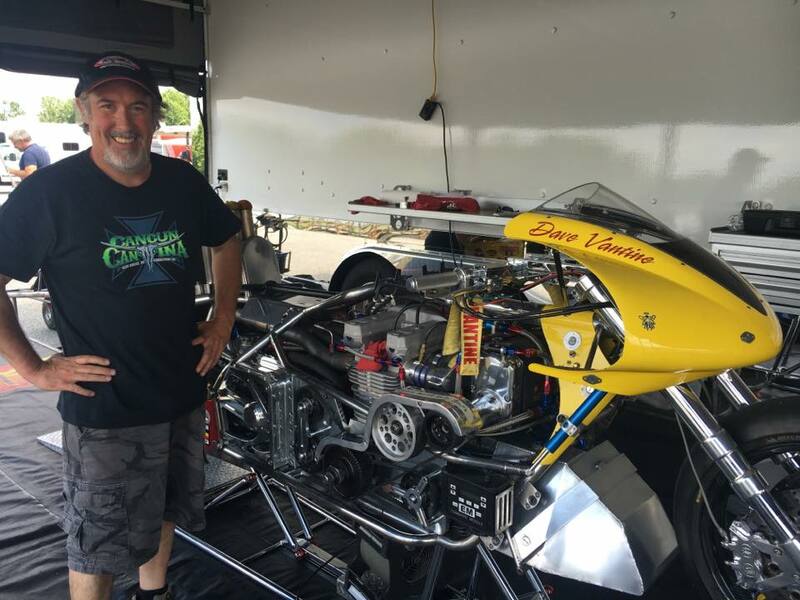 Now entering his sixth season aboard a Top Fuel bike, Vantine says he’s still greatly enjoying every moment in the sport. “This is a passion of mine. I’ve always enjoyed climbing ladder” Vantine said. Vantine is also exited for some more epic matchups with his friendly rival, the Spiderman. 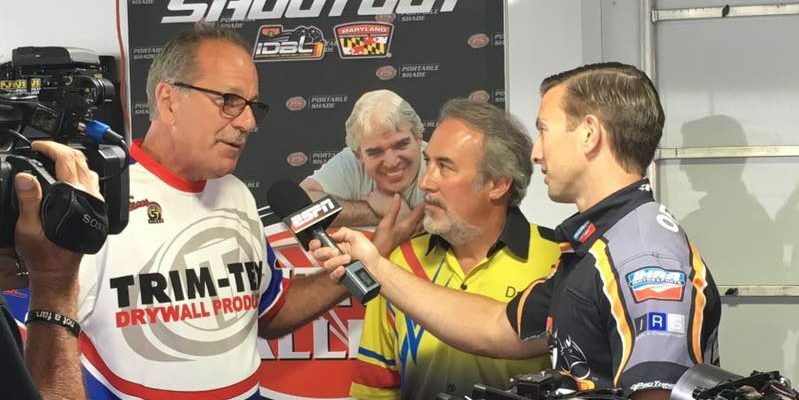 From sportsman racing, to finding tremendous success as a Pro Mod competitor Vantine says the mindset in Top Fuel Motorcycle racing is very unique. 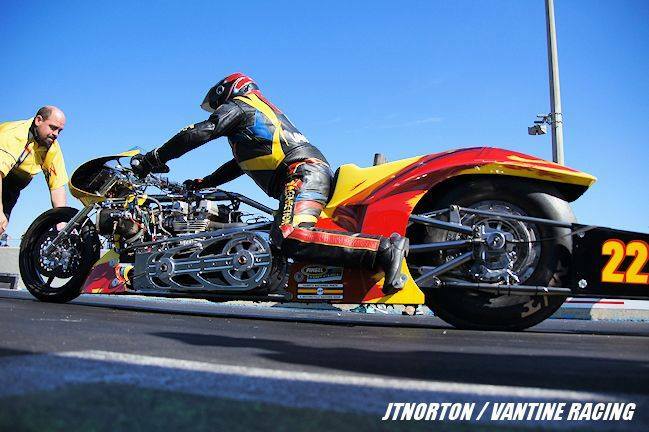 Vantine has some extra motivation knowing this is likely his last season on his beloved Yellow Bullet. Vantine reluctantly listed the bike for sale while a new motorcycle is being built. 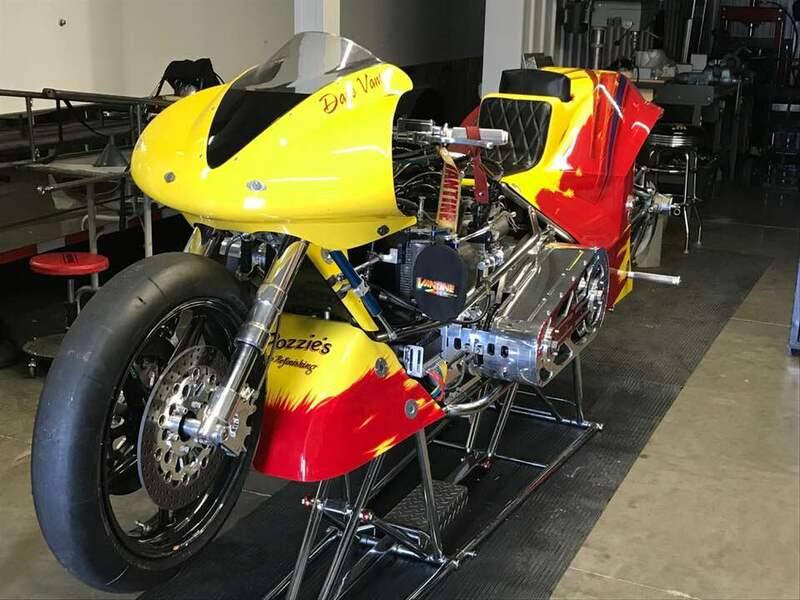 Vantine’s new motorcycle is expected to hit the track in 2019. The Yellow Bullet is listed for the blowout price of $165,000. Demand for the motorcycle could increase even more with Vantine expected to step up in performance. Vantine opens up the season at the ManCup Spring Cup from South Georgia Motorsports Park, April 4-6.